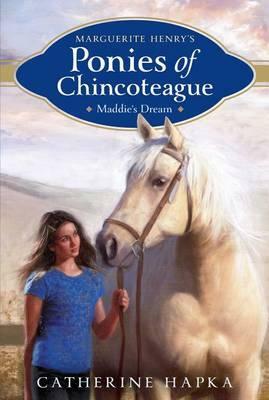 Misty of Chincoteague is a classic of children's literature. Written by Marguerite Henry in 1947, it tells the story of a family raising the foal of a wild horse on a small island off the coast of Virginia in the US. It's still in print today, has inspired a movie, and was one of my favourite books as a child. It's also the inspiration behind this new series, which tells the stories of the descendants of Misty. In the first book, we meet Cloudy and Maddie. Cloudy is owned by the Solano Stables, but Maddie feels like she's really her horse. She's the one who rides Cloudy most and she knows that they're the perfect riding combination. So when Cloudy's original owners return and want to buy her, Maddie is devastated. She can't lose Cloudy — especially not to a family who didn't treat her properly when they first owned her. Maddie has to come up with a plan. So she confides in her three friends on the Pony Post chat forum. Although they don't live close by, Nina, Brooke and Haley all own Chincoteague ponies so they know exactly how Maddie feels. Together, will they be able to stop the Richardson family from buying Cloudy back and taking her from Maddie forever? While this book does make occasional reference to the original 'Misty', it's not necessary to have read the original to enjoy this book. However, you do need to be more than just a fan of horses. Catherine Hapka goes into quite a bit of detail about the care and grooming of horses and also riding technique. This will be fascinating to dedicated pony club girls (and boys) but could see lesser horse addicts skimming sections. It's not all about horses though. Maddie is also faced with deciding whether to pursue an opportunity to play league soccer (and make her parents happy) or follow her heart and stick with riding. Themes of friendship, loyalty, responsibility and resourcefulness are woven into the storyline, but at its heart this is really a story about that magical bond between a girl and a horse that only someone who's happiest with a pony whickering softly in their ear will truly understand.